Daniel Carter Beard (1850-1941), known to millions of Boy Scouts as “Uncle Dan,” was a prominent Progressive-era reformer, outdoorsman, illustrator, and author. Born in Cincinnati, Ohio on June 21, 1850, Daniel was a gifted artist and a bookworm as a child. He loved the great outdoors and formed a club called the “Boone Scouts” with his friends. Beard graduated from Worrall’s Academy in Covington, Kentucky in 1869 with a degree in engineering and worked as a surveyor and engineer. In the early 1870s Beard and his family moved to Flushing, Queens. After working for a few years at the Sanborn Map and Publishing Company, he made his living as an illustrator. Beard’s drawings graced the pages of dozens of newspapers and popular magazines, from the New York Herald to Harper’s Weekly, and from St. Nicholas to Godey’s Magazine. His work attracted the attention of Mark Twain, who hired Beard to illustrate The Prince and the Pauper (1881) and A Connecticut Yankee in King Arthur’s Court (1889). Beard became interested in the plight of urban youth while touring tenements in the Lower East Side in 1878. Upon reading a sign with the words “No dogs or children wanted,” he wrote: “I thought to myself that the fools have built an immense city without any place for the young at all.” He actively campaigned to create new urban parks and playgrounds for healthy outdoor recreation. As editor of Recreation and later of Woman’s Home Companion magazine, Beard founded a nationwide scouting program for boys, known as “The Boy Pioneers” or the “Sons of Daniel Boone,” in 1905. Beard’s group merged with the Boy Scouts of America in 1910. More than one million boys joined the Scouts while he served as National Commissioner for thirty years until his death in 1941. Beard’s other accomplishments included teaching at the Art Students’ League of New York, serving on the Board of Education, establishing an outdoor school for boys, and writing dozens of books. He loved to explore the Queens countryside, and he first met the woman he married, Beatrice Alice Jackson, while hiking through Newtown. This property was acquired by the independent Town of Flushing in 1875 and named Flushing Park. In 1898 jurisdiction passed to New York City when Staten Island, Brooklyn, and Queens were incorporated into Greater New York. From the 1870s to the 1940s, the park was home to the beloved cast-iron and zinc Neptune Fountain depicting the Roman god of the sea and a bevy of mermaids. According to the 1913 Annual Report of the Department of Parks, this was the site of the first public Christmas tree erected in a Queens park. On Christmas Eve in 1913, Flushing residents gathered to light the tree and hear a concert by a 26-piece Parks Department band. In 1942 the western portion of Flushing Park was named for Beard by local law. Four monuments stand in the two parks: (from west to east) a Spanish-American War Memorial Flagpole (1950), a Civil War memorial obelisk (1865), an ASPCA horse trough (1909), and a World War I memorial by Queens sculptor Hermon A. MacNeil (1925). Volunteers from the North Flushing Neighborhood Association and the Flushing Local Development Corporation install holiday displays throughout the year and work with Boy Scout Troop #461 and students from the Daniel Carter Beard Junior High School to plant, maintain, and clean the park. 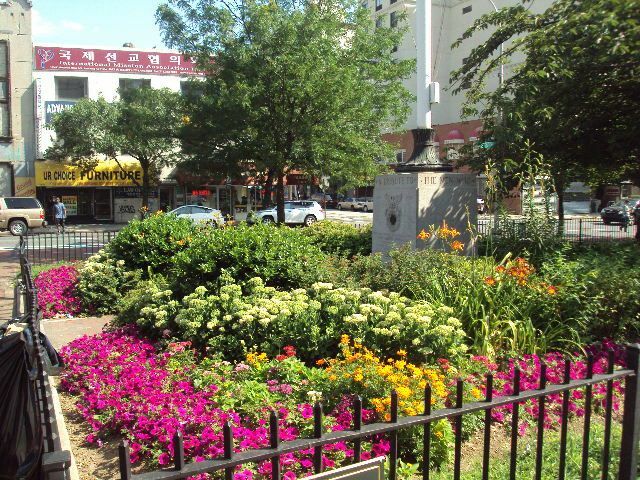 Their efforts keep one of the oldest parks in Queens festive, green, and clean.